There are two places in the area where you can visit Yellowstone or Rotorua – like geothermal sites. If you like to walk, boiling hot mud springs, sulfur springs, steam vents, and fumaroles are abundant at Las Pilas and Las Hornillas (not to be confused with Las Hornillas on the slopes of volcán Miravalles, near the village of La Fortuna de Bagaces) on the southern slope of the volcano inside the park. The activity isn’t far from the surface anywhere in the region. One of the largest geothermal electricity generation projects in the world is scattered through the valley between Rincón de la Vieja and volcán Miravalles. Driving near Guayabal or La Fortuna de Bagaces you can’t help but notice the stainless steel steam delivery pipes that snake their way from wells driven into the earth to the turbines in the generating stations. The name, Rincón de la Vieja, translates to English as ‘the old woman’s corner.’ According to locals, the indigenous people of the Guatuso tribe named the volcano thus for one of two reasons. Either there was an old witch on top of the mountain who sent columns of smoke into the air when she was angry, or there was a kindly old woman occupying the same nook, and the smoke was from her cooking fire as she prepared meals for weary travelers. 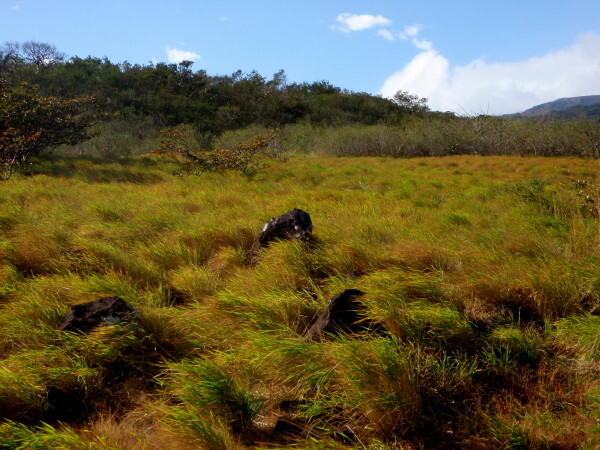 Maybe it’s both because the Rincón de la Vieja crater has had at least eight periods of intense volcanic activity, and still bubbles and steams. The climb to the top of volcán Von Seebach and Rincón de la Vieja is steep and strenuous, but very rewarding. Starting from the mid elevation tropical dry forest transition zone near Las Pailas ranger station the trail aims straight for the peak. It climbs into premontane wet forest where the trees covered with epiphytic vegetation hunch closer to the ground in the harsher climate. The final ascent over bare volcanic rock to the summit of Von Seebach (6,217 feet) is often in the clouds as is the trail down and around the rim to volcán Rincón. 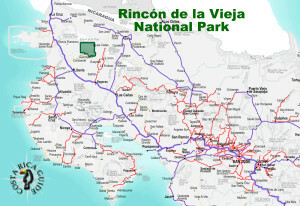 It is possible to continue west from the crater of Rincón to volcán Santa Maria and down the slope to that ranger station and there is also a trail from the rim to Dos Ríos on the north edge of the park. It’s strongly recommended to hire a guide to attempt either of these trails and please note that in 2014 and 2015 the trails to the peaks have been closed intermittently due to abnormally high levels of activity. Have a backup plan – like the hot springs maybe? 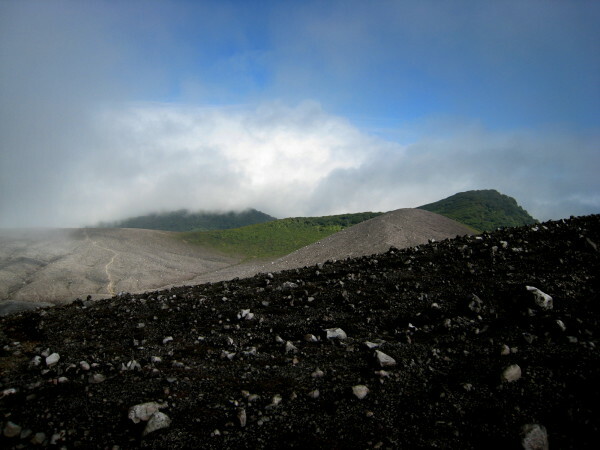 Another main trail in the park is a traverse along the slopes of volcán Santa María between the Las Pailas (aka Las Espuelas) and Santa María stations. Much less challenging but every bit as rewarding in different ways. 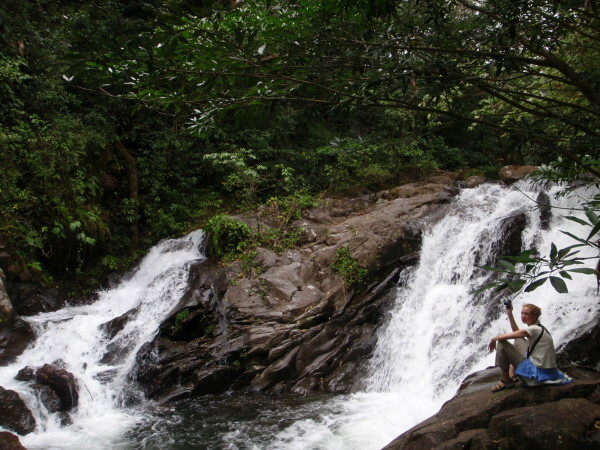 You stay mainly in the dry forest and rainforest crossing streams and rivers each of which offers a side trail to an amazing waterfall or two or natural back country hot springs. …roots, rock, reggae?…keep your eye on the roots. It’s not a trick of the light, the roots really are rocking and moving as the wind twists this giant tree on a windy day on the traverse trail. Note: in early 2016 the trail around Las Pailas was undergoing re-routing and “improvements” which in the end are intended to make them substantially wheelchair accessible and all season. During the ongoing construction the alternate routes are significantly less accessible, narrower, steeper and rockier. 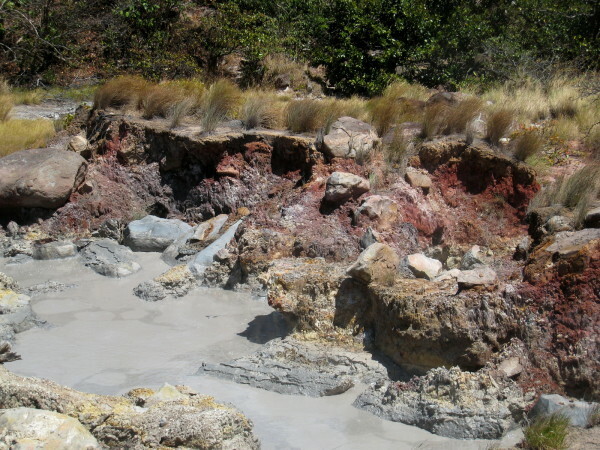 Las Pailas – the cauldrons is the name of the western entrance to Rincón de la Vieja National Park and also for the boiling mud pots, steam vents and mini-geysers near the ranger station. 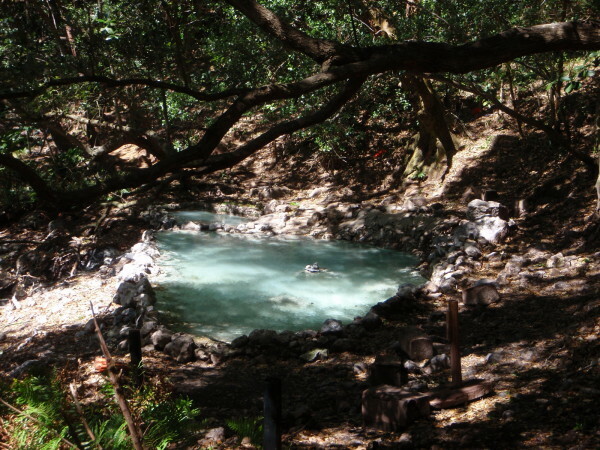 A loop trail with interpretive signs leads from the ranger station past an interesting selection of geothermal features but our favorites -natural hot springs, mini geysers and fumaroles – are a little farther afield on the Crater Traverse trails. Other trails from each station lead to miradors and yet more waterfalls and anywhere you walk in the area you’ll see birds and other wildlife. 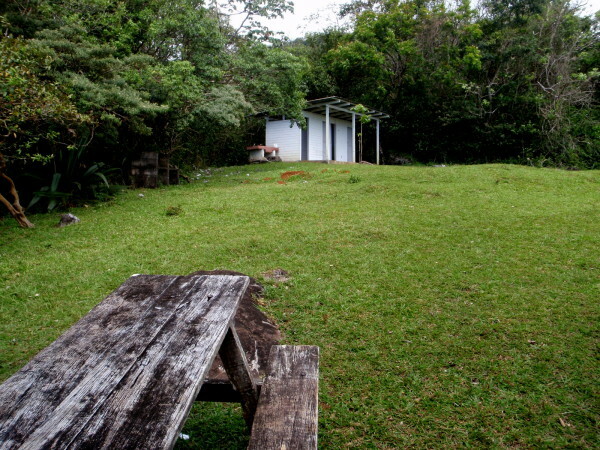 The campground at Santa María station is simple but one of the nicest of any Costa Rican national park. Grassy tent sites, picnic tables, shade trees, fresh water and outhouses. The park is open six days a week (CLOSED MONDAYS) year round including holidays. 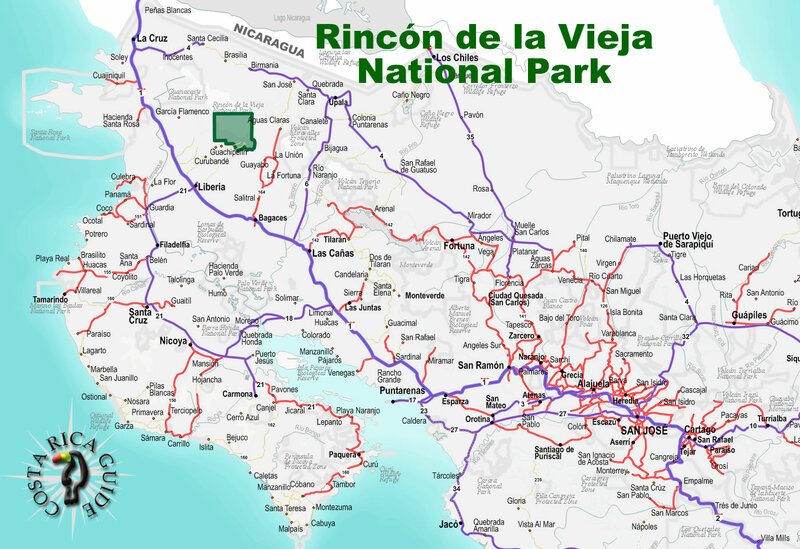 This is one of the hotter drier areas of Costa Rica, and the whole region around Rincón de la Vieja has more predictable seasons than the rest of Costa Rica. The chance of rain is much less during the dry season from December to April, but the higher you climb, the more likely you are to get wet… any time of the year. Although it is fairly likely that it will rain on any given day during the rainy season (AKA the green season), it is also fairly likely that it will be a short shower in mid-afternoon. The rainy season which lasts from May until November is also usually interrupted by a two or three week dry spell in late July or August called the Veranillo de San Juan (saint Joseph’s little summer). Use the drop down menu to see weather patterns and other seasonal information for the month you are thinking about visiting. This huge park protects 14,087 hectares with widely ranging elevations range from 980 to 1987 meters (3215 to 6519 feet). Habitats are diverse and include cloud forest, tropical rainforest-upland, tropical rainforest-lowland and tropical dry forest.